Payments may also be set up by Electronic Bank Draft – this convenient payment option ensures that the customer will always pay the net amount due without the hassle of writing checks or having to mail payments. The draft is sent to the bank on the actual due dates. Click the TVA Icon link to access the TVA Energy Calculator to see how you can conserve power! Call 662-256-5633 Monday through Friday 8:00 a.m. to 5:00 p.m.
After hours and weekends call 662-256-3931 or 662-646-0024. TVA and the City of Amory utilities offer the Energy Right Heat Pump Plan to you at no money down, low interest rates, and up to ten years to pay for energy efficient central heat and cooling pump systems. All you do is make monthly payments on your utility bill. Provides attractive cash incentives for a new home being built. The outdoor security light turns on at dusk and off at dawn. For a small monthly fee, the City of Amory Utilities provides the light, pole, installation, electricity, and maintenance. COMMERCIAL ACCOUNT SERVICE AGREEMENT 10-19-17 – You must have a Clearance Form from the City of Amory City Clerk’s Office with you when you arrive. Please visit the Amory Planning and Zoning Office and then City Clerk’s office if you do not have this form. They are both located at 109 South Front Street. 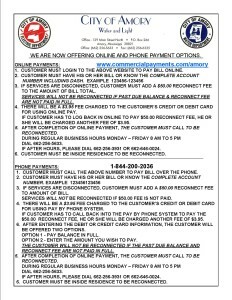 RESIDENTIAL ACCOUNT SERVICE AGREEMENT 10-19-17 – You must have a copy of your deed or lease agreement (if renting) with you when you present for residential service at the City of Amory Utilities Department.